The star fruit is that green garnish the sweet potato vendor often displays on his stand. Referred to as ‘Kamrakh’ in Hindi and Gujarati, ‘Ambanamkaya’ in Telugu, ‘Thambaratham’ in Tamil, ‘Kaparakshi Hannu’ in Kannada, ‘Chaturappuli’ in Malayalam, Karambal in Marathi, ‘Kamranga’ in Bengali. and ‘carambola’ in some parts of the world. This star-shaped tropical fruit appears in both sweet and sour tastes. The sweet fruit is found from summer to autumn and the sour fruit from the end of summer to the middle of winter (1). It’s a rare commodity, but with high nutritional value, and used widely in the kitchen. It makes a great juice, smoothie, or shake, or you can just eat it raw. Best when fresh, it should be consumed within 3-4 days, or else the nutritional value dips. Store the fruit in a cool, dark place and cut it just before you eat. 1. The star fruit is a literal one-stop medicine shop. It’s used the world over as a home remedy for hangovers and sunburns. It works well on coughs, fever, ulcers and sore throats. It also effectively combats diabetes. The leaves of star fruit can be used to treat stomach ulcers, pus-filled skin inflammations and boils. It improves digestion. Flowers of the sweet star fruit are good for treating coughs in children (2). 2. Star fruit contains an antimicrobial agent (3) which fights the microbial bacillus cereus, e.coli, salmonella typhus, etc. It also cures eczema. 3. With only 30 calories per fruit plus lots of fibre, star fruit, like kokum and passion fruit, is a great choice for anyone trying to lose weight. It contains 9.5g of carbohydrate per serving, including 2.5g of dietary fibre. This provides 3% of the daily requirement for carbohydrates and 10% of the daily requirement for dietary fibre. They’re also full of antioxidants and flavonoids. 4. 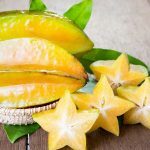 In addition to vitamins A, B and C, that help keep the metabolism of the body steady and strong, star fruit also has thiamine, riboflavin, and niacin in very small concentrations. It’s a good source of vitamin B9 (folic acid), which helps reduce the risk of heart disease and stroke, and it also contains vitamin C and vitamin B5 (4). 5. It has low amounts of all essential minerals but is especially rich in copper (14% of Recommended Dietary Allowance (RDA) in one medium sized fruit). Star fruit lowers cholesterol levels and adds bulk and moisture to faeces (5). 6. The fruit has also been used to treat sore eyes. If you are looking to up the magnesium content in your diet, then eat food rich in vitamin B6 along with star fruit. 7. This ‘magic’ fruit is given to lactating mothers as it is commonly believed to stimulate the flow of milk. A decoction of its leaves and roots (prepared separately or in combination) can help cure headaches, ringworm, and chicken pox. To cure nausea and indigestion, eat half a piece of the fruit and repeat the dose after three hours (6). 8. But if you have a renal complaint, then the star fruit is not for you, because it has a very high concentration of oxalic acid. Scientists consider it an anti-nutrient compound as it interferes with absorption and metabolism of several natural minerals such as calcium, magnesium, etc. 9. Like grapefruit, the star fruit may interfere with the medications you take for other illnesses. If on prescription, make sure to consult your doctor first. 10. Star fruit allows other nutrients that are good for the body and hair to circulate more freely. It’s an excellent natural cure for hair loss since it is a good source of antioxidants and vitamin C which can help delay the natural ageing process. 11. B-complex vitamin, which is essential for hair growth and help in keeping hair strong and healthy, is abundantly available in start fruit. 12. 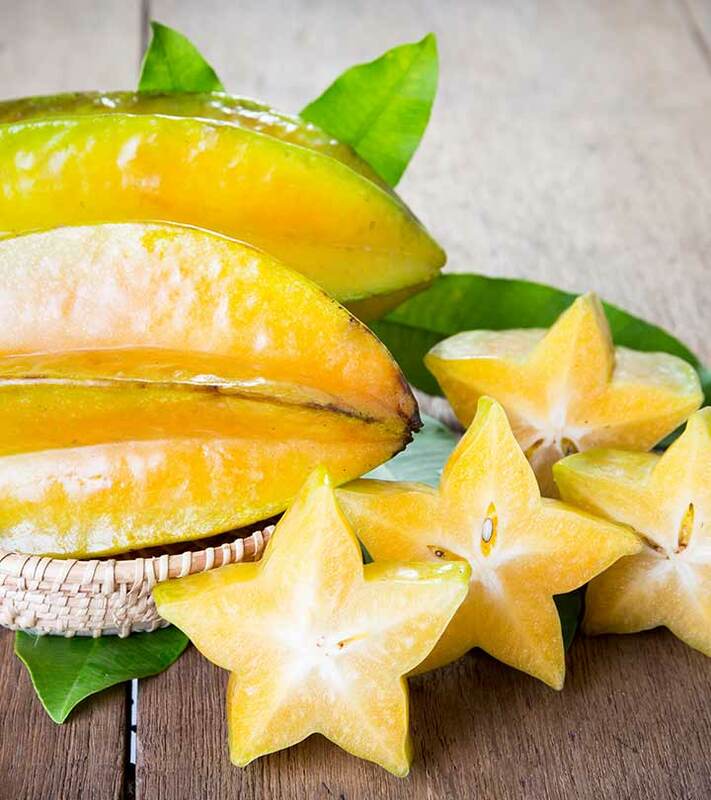 Eat a star fruit or use it directly on acne-prone skin or oily skin as a face mask, it benefits the skin both ways. 13. It purifies the blood, making the skin glow (7). Star fruit contains zinc which reduces a tendency towards acne breakouts. It’s wholly recommended for people of all ages as it has antimicrobial effects. So if your local fruit shop flaunts a fresh batch of star fruit, don’t even think, just buy them! And spread the word – the humble start fruit is a winner all the way!